Tori Japanese wallpaper is the latest offering from divine wallpaper designers, Graham & Brown. It’s a celebration of artistry and eastern art; no wonder it’s Wallpaper of The Year 2019. 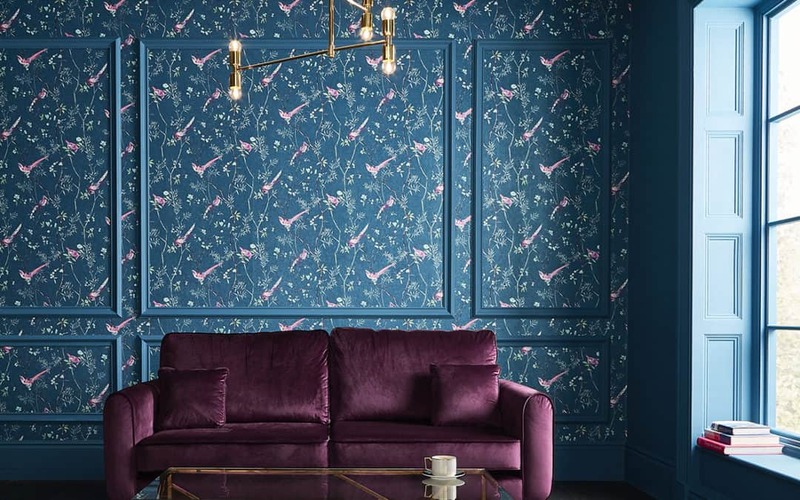 Graham & Brown has unveiled its Wallpaper of The Year: Tori. Meaning ‘Bird’ in Japanese, the new Tori Japanese wallpaper is an exquisite and delicately hand-painted design. In the Chinoiseri style, this beautiful wallpaper depicts a bird trail which celebrates Eastern Art. Personally, I adore wallpaper and love working with it in my Adelaide interior design business. Wallpaper adds depth, mystery, luxury, fun, elegance and texture to a room… although not all at once. 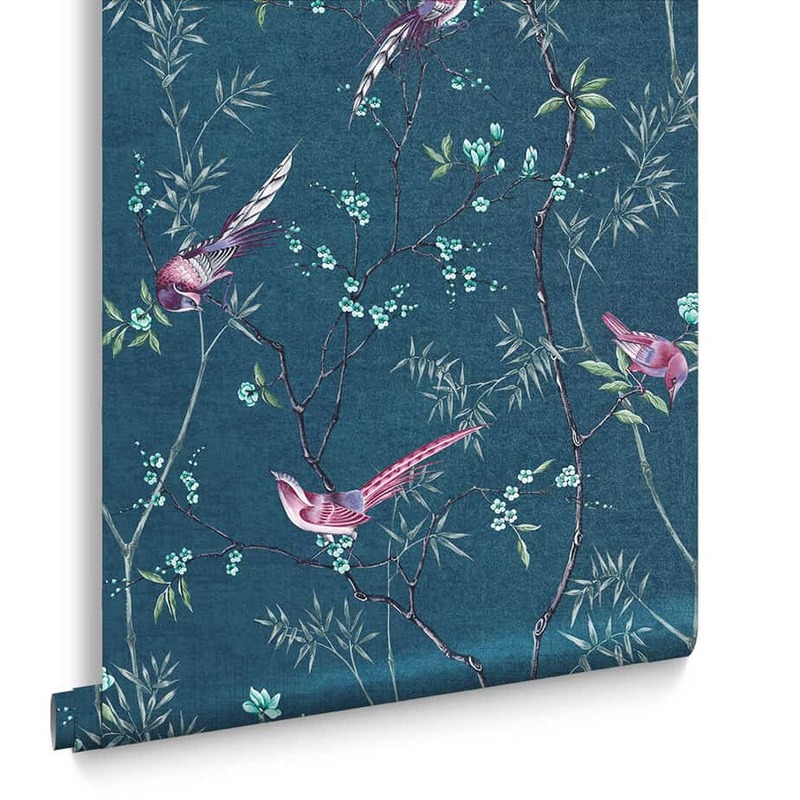 The new Tori Japanese wallpaper has a stunning background in regal teal. 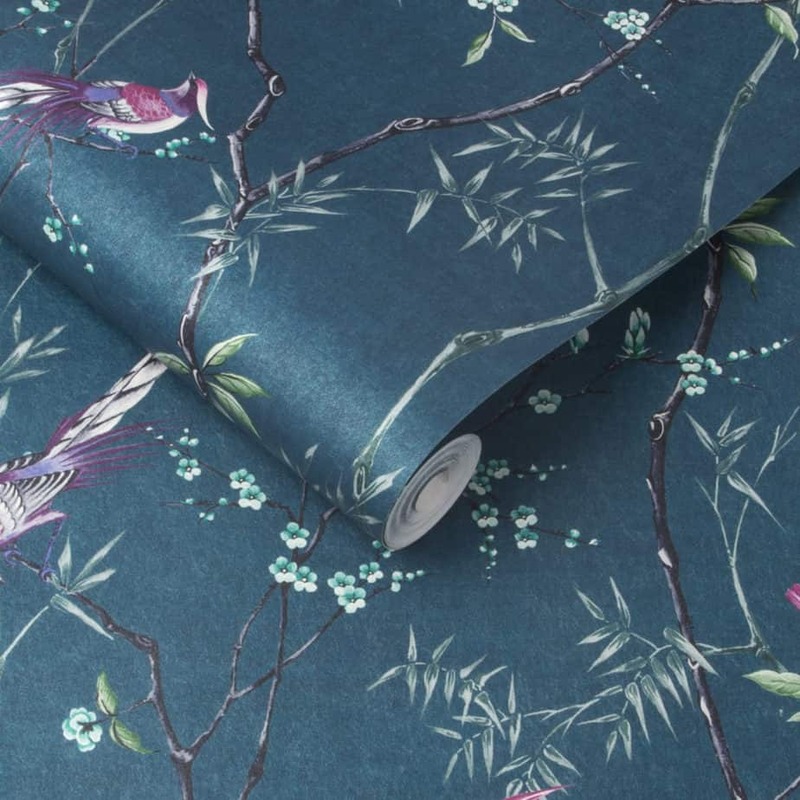 It’s a dynamic colour printed on textured oriental paper that shimmers like glistening silk. This will add glamorous luxury, colour and boldness to any room. Please don’t be afraid to work with bold colours. Perhaps you don’t want an entire room wallpapered in a bold print (or maybe you do). Feature walls, done well, don’t make your home look like a display house. One a single wall, wallpaper can provide a beautiful backdrop to a bed akin to a fabulous bedhead. Wallpaper is also used on the wall behind shelves, in the triangle under stairs, and even on the ceiling. Do you have very high ceilings? Wallpapering with a subtle or bold print will make a room feel cosier as it gives the illusion of a lower ceiling. Have you ever thought about wallpapering a very small room? A bold print in a small room, like a toilet or powder room, looks amazing. To complement its Wallpaper of The Year 2019, Graham & Brown have also released their Colour of The Year 2019: Tiru.I know my clients have been asking for luxurious finishes and opulent colours, and Tiru delivers. Now available in paint, Tiru is taken from the background of the Tori Japanese wallpaper. This vibrant regal teal brings good luck and celebrates longevity and tranquility. Have confidence in your own sense of style and don’t discount using wallpaper – it’s FABULOUS! Need Wallpaper and Paint Help? I am obsessed will wallpaper, paint, colour and design. If you need some assistance, please ask me about my interior design services which include floor plan re-design and 3D imagery. Find out more by contacting me on 0421 043 505 or penelope@plushdesigninteriors.com.au. Please see my article on 5 ways interior designers save you money.